What is Distal Realignment Procedures? Maquet procedure - In this procedure, the tibia tubercle is cut, keeping the patellar tendon attachment intact. The tubercle is elevated by wedging the loosened piece of bone using a bone block. This procedure cannot move the tendon and tubercle medially (towards the inner aspect of the knee). Elmslie-Trillat procedure - This is a procedure like Maquet procedure, but the tendon and tubercle can be moved medially. 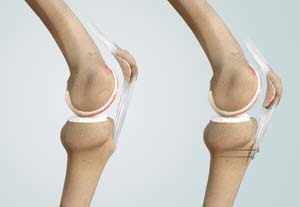 Fulkerson procedure - In this procedure, the tibia tubercle is moved more towards the inner aspect of the knee. This is achieved by breaking the bone into sharp pieces (splintered) which allows the bit of bone and the tendon to move more medially. After the procedure bits of bone are held in place using screws. Hauser procedure - In this procedure, the tibia tubercle is moved medially, but not moved forward (anterior). Because of the shape of the tibia, the tubercle may shift its position more posteriorly and the patella may press down causing pain. Roux-Goldthwait procedure - It is a distal realignment procedure where the patellar tendon is split vertically. The lateral half of the patellar tendon is pulled under the inner half (medial) and attached to tibia. This pulls the patella over to the center and helps prevent excess lateral shift.